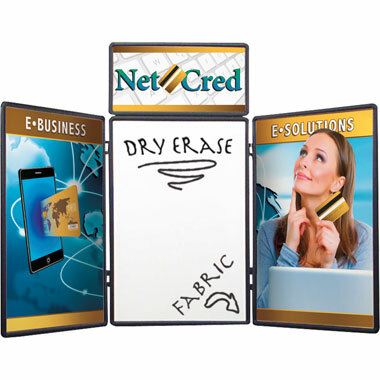 A tri-fold tabletop display ideal for portable sales presentations, with 6′ wide Dry Erase™ whiteboard on one side and Velcro® receptive fabric on the other – available in three colors. 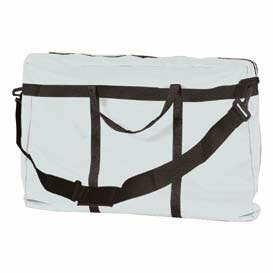 One header graphic, three main graphics, and a soft carry case are included. 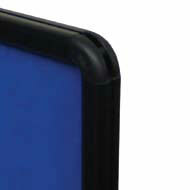 The frame is a durable, lightweight plastic with rounded corners. 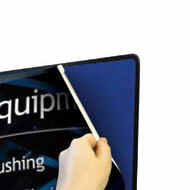 To set up, simply unfold display and fasten the header. Also available in a 4′ width. The flat shipping rate for this package is $45 USD for standard delivery within the continental United States. Alternative shipping methods and International shipments are available; please contact for a quote.